This video and step-by-step walkthrough shows how to use enum types with the Entity Framework Designer. It also demonstrates how to use enums in a LINQ query. This walkthrough will use Model First to create a new database, but the EF Designer can also be used with the Database First workflow to map to an existing database. 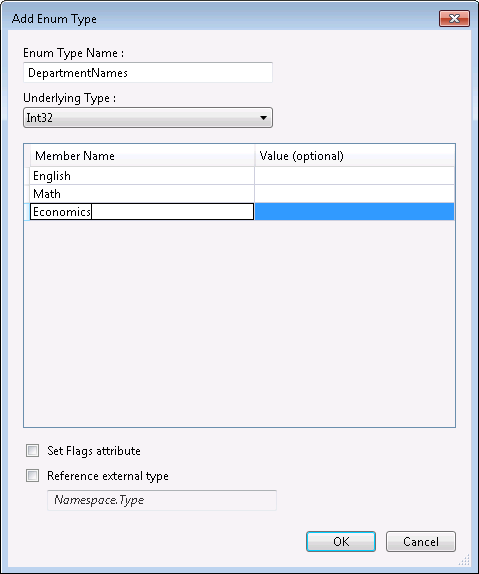 Enum support was introduced in Entity Framework 5. To use the new features like enums, spatial data types, and table-valued functions, you must target .NET Framework 4.5. Visual Studio 2012 targets .NET 4.5 by default. In Entity Framework, an enumeration can have the following underlying types: Byte, Int16, Int32, Int64 , or SByte. 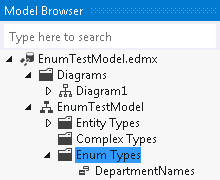 This video shows how to use enum types with the Entity Framework Designer. It also demonstrates how to use enums in a LINQ query. The Entity Designer, which provides a design surface for editing your model, is displayed. Generates the EnumTestModel.edmx file that defines the conceptual model, the storage model, and the mapping between them. Sets the Metadata Artifact Processing property of the .edmx file to Embed in Output Assembly so the generated metadata files get embedded into the assembly. Adds a reference to the following assemblies: EntityFramework, System.ComponentModel.DataAnnotations, and System.Data.Entity. Creates EnumTestModel.tt and EnumTestModel.Context.tt files and adds them under the .edmx file. These T4 template files generate the code that defines the DbContext derived type and POCO types that map to the entities in the .edmx model. When you build, warnings about unmapped entities and associations may appear in the Error List. You can ignore these warnings because after we choose to generate the database from the model, the errors will go away. If you look at the Properties window, you will notice that the type of the Name property was changed to DepartmentNames and the newly added enum type was added to the list of types. If you switch to the Model Browser window, you will see that the type was also added to the Enum Types node. Now we can generate a database that is based on the model. A dialog asking if you want to create a new database will pop up, click Yes. Click Finish Clicking Finish does not execute the DDL script. Open the Program.cs file where the Main method is defined. Add the following code into the Main function. The code adds a new Department object to the context. It then saves the data. The code also executes a LINQ query that returns a Department where the name is DepartmentNames.English. To view data in the database, right-click on the database name in SQL Server Object Explorer and select Refresh. Then, click the right mouse button on the table and select View Data. 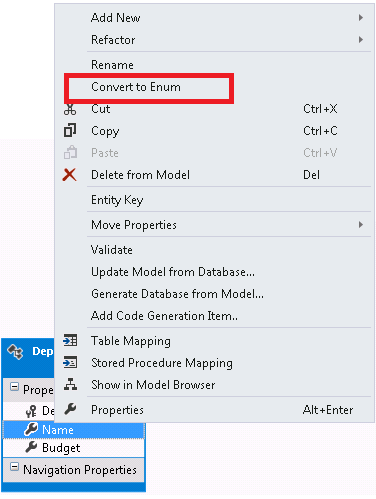 In this walkthrough we looked at how to map enum types using the Entity Framework Designer and how to use enums in code.